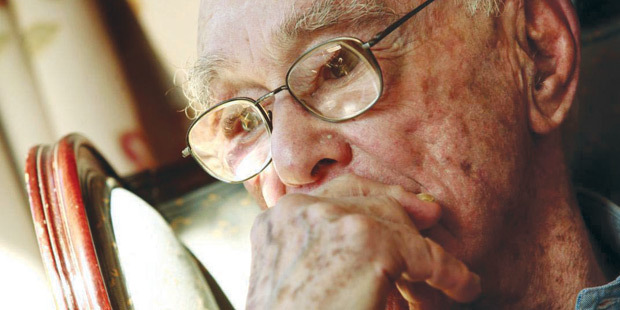 In Jerome Bruner’s 100th year, he whispers the lines of T.S. Eliot, revisits the loss of his father in childhood, and talks about the sources of human happiness and misery. And then he weaves these strands of thought together as if they were one. In an afternoon chat, Bruner, one of the most influential psychologists of the 20th century, is every bit the acrobatic meta-connector of ideas that most anyone who has ever known him suggests. Bruner was born blind but had his sight restored at age two. His father died when he was 12, a hurt that endures. Before he died, the watchmaker father sold his company to Bulova, leaving his son a “rich kid,” a fact which he tried to hide. A Duke undergraduate and Harvard PhD in psychology, Bruner co-founded the Harvard Center for Cognitive Studies, which favored the study of the human mind over pure behavior. When offered a chaired position at Oxford, Bruner sailed his boat across the Atlantic to get there. He was the brains behind Head Start, the federal preschool program, and scholars have called his influence on the ways of learning “epochal.” He has written 15 books. Nearly all of that occurred before Bruner arrived at NYU Law in the 1980s. That was around the time Peggy Cooper Davis, now John S.R. Shad Professor of Lawyering and Ethics, heard Bruner give a talk. She was struck by how Bruner’s musings across many disciplines could enrich the teaching of law. She sought out University Professor Anthony Amsterdam. 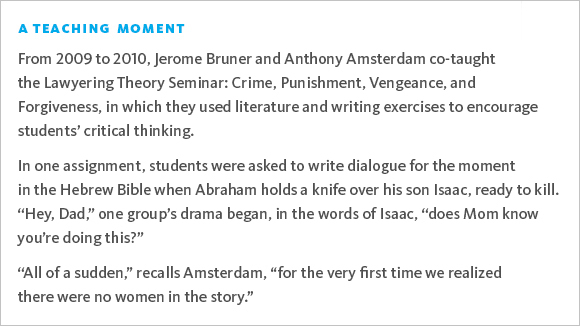 Amsterdam had started the Lawyering Program to help first-year students role-play as lawyers and advance their critical thinking. He had grown interested in storytelling. Bruner, he learned, was well versed in literary theory, culture, and linguistics. And psychology failed to look at how societies create social norms. The law, on the other hand, takes human passions, such as vengeance, and tries to codify them into rules about crime and punishment, often harshly. That intrigued Bruner. In 1991, Bruner was appointed a visiting professor, and seven years later, University Professor. Co-teaching with Amsterdam, Davis, and Russell D. Niles Professor of Law Oscar Chase, Bruner drew on cognitive theory, literary criticism, and cultural anthropology, helping colleagues and students examine the humanistic in legal practice.